The Elizabethan era, so named because it is the epoch in which Queen Elizabeth I reigned over England, spanned from 1558 to 1603. The Renaissance and its motherlode of music and literature peaked during this era, which spawned William Shakespeare, Francis Drake, and Sir Walter Raleigh. 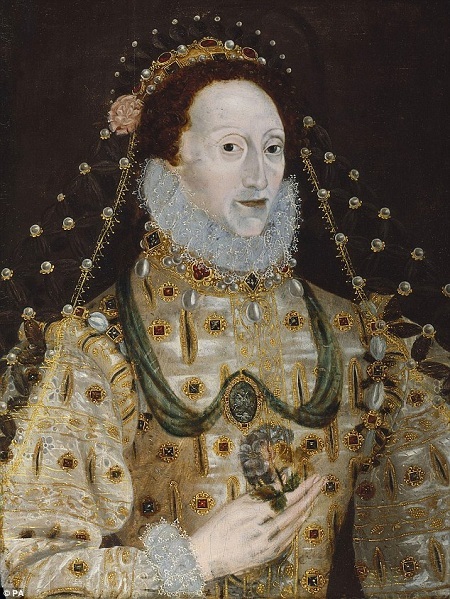 The Elizabethan Era was named after Queen Elizabeth I, daughter of Henry VIII and Anne Boleyn. Anne Boleyn was executed when Bess was two and a half. Good Queen Bess, frequently known then and now as The Virgin Queen, reigned over England and Ireland from the end of 1558 until she died in March of 1603. This period was known for such things as William Shakespeare and Christopher Marlowe enriching the arts. In the area of exploration, it was the era of Francis Drake, who circumnavigated the globe, and Martin Frobisher, who explored the Arctic; and the first English settlers left for the Eastern Seaboard of North America, establishing the ill-fated colony on Roanoke Island in 1587. The Protestant Reformation became palatable to many when Queen Elizabeth re-established what would eventually be called the Church of England. In the English world of science, William Gilbert published his findings about magnetism. The era was marked by abundant fairs, festivals, jousts and other tournaments, as well as Shrove Tuesday, which is called Mardi Gras elsewhere. This celebration was characterized by mobs celebrating in the streets, indulging themselves in their vices to get ready for Lent. But there have long been whispers that The Virgin Queen was actually a man. And the story was written about by author Bram Stoker, in his final nonfiction book, "Famous Impostors." When she was 10, Princess Elizabeth had been sent to a small village in order to avoid the plague which was ravaging London. Ironically, she died after taking ill, and her governess and guardian were terrified about what Henry VIII would do to them and the other servants when he found out. And given that their only job was to keep the princess safe and the king's well-known anger management problems, their fear was not unfounded. So the governess set off to nearby villages where she found a child who looked like the young princess, a local boy named, who they passed off as Bess. They tutored him in the art of being a princess, and the boy look-alike kept up the pretense all of his life as Queen Elizabeth. Her tutor, Roger Ascham, had some questions about her change in behavior and countenance. Where the child had been shy and timid, she had changed to a bold and fearless teenager. While as a little girl, she was brilliant and a quick learner, but as a teen, she was slow and a studier rather than a prodigy. He could not voice his concerns outright, for fear of being charged with treason for the very question, but he did write about his observation that the young girl who had soaked up facts like a sponge was in her later childhood more like a shallow cup, and that if wine were poured into that cup too quickly, it would splash out of the cup. Portraits of Bess as a child showed her to be a slender, delicate looking child with a face shaped like a heart, while many of her later pictures showed her face as a decidedly different shape and wearing thick furs or heavy lace about her neck and shoulders as if to disguise them. She wore heavy makeup and wigs all the time, and no one was allowed to see her without them. She refused to marry any of the many who asked for her hand in marriage, and thus, she never created an heir to the throne. She had vowed to never take a husband, even, she said, if the Emperor of Spain offered his son. Not only did she keep her vow, but she started a war which nearly ended in Spanish invasion. On more than one occasion, she stated publicly, "I have the heart of a man, not of a woman, and I am not afraid of anything!" And in her famous speech to the troops as the Spanish Armada neared England, "I have the heart and stomach of a king, and of a king of England, too." There was no autopsy after she died, adding all the more fuel to the fire started by Bram Stoker. True? Not? We may never know for sure, as numerous calls to have her tomb opened and her bones tested to see her gender have not been granted. Contains numerous portraits as well as articles about the period, the life and death of Queen Elizabeth, the language, and superstitions. Delves into all aspects of Elizabethan life, including the food, styles, theater, and the Spanish Armada. Also contains an Elizabethan dictionary. Covers the history, fashion, arts, and lifestyle of the Elizabetha period in Europe and also shares details about religion and key personalities, including Elizabeth herself, Shakespeare, and Anne Boleyn. Features the Queen's family and life with a complete biography which covers her early life, marriage, succession, pastimes, wardrobe, church, government and more. Presents details about the Renaissance and the Elizabethan era, including heraldry, sumptuary laws, life in the Court of the Queen, and a section about Mary, Queen of Scots. The focus of this website is the bubonic plague, also called the "black death," during the Elizabethan era in Europe. Details the spread of the Plague, the effects, and the symptoms. Search for Elizabethan Era on Google, Bing, or Yahoo!